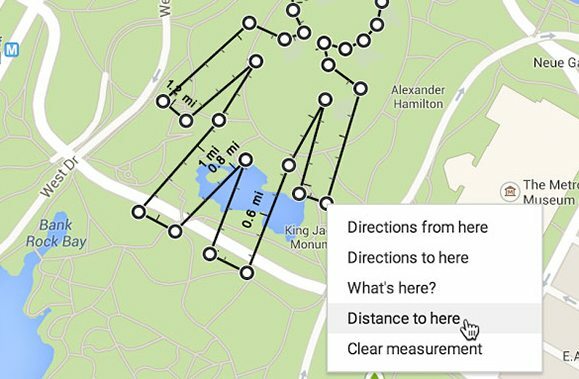 Now you can measure distances as the crow flies, using Google Maps. It was only a matter of time wasn’t it? Previously, measuring the distance of a straight line (ignoring mountains or buildings) using Google Maps wasn’t possible. You needed to stick to official roads and highways. But if you wanted to calculate your personal best run time from the office to your home (as you do), via a parks footpath for example, Google Maps couldn’t help. Well… not until now anyway. In a similar fashion to MapMyRun, Google Maps now allows you to measure and calculate distances between points, even if the Indian Ocean sits right in the middle. 1. Open the new Google Maps. 2. Right-click on your starting point. 4. Click anywhere on the map to create a path you want to measure. Click to add additional measuring points. 5. [Optional] Drag a point to move it, or click a point to remove it. 6. Look on the map and under the search box for the total distance. 7. When done, click the X in the card under the search box or right-click on the map and select Clear measurement. To measure the distance between points in the classic Google Maps, you’ll first need to turn on distance measurement. 1. Open the classic Google Maps. 2. Click the Maps Labs link at the bottom of the left-hand panel. 3. Click the Enable button next to Distance Measurement Tool. 2. Click the ruler icon at the lower left-hand corner of the map. 3. Click your starting point on the map. Click to add additional measuring points. 4. A red path will appear on the map between the two points, and the distance will be shown in the left panel.